Mitch Keamy is an anesthesiologist in Las Vegas Nevada Andy Kofke is a Professor of Neuro-anesthesiology and Critical Care at the University of Pennslvania Mike O'Connor is Professor of Anesthesiology and Critical Care at the University of Chicago Rob Dean is a cardiac anesthesiologist in Grand Rapids Michigan, with extensive experience in O.R. administration. 30 years old, 4 kids, and Pre-Med. Am I crazy? Or…..we have to eat too! Recent reports offer examples of efficiency driven non therapeutic CQI projects in Anesthesia and Critical Care (1,2,3). These reports describe innovations in process designed to conserve resources but with no intent to improve the outcomes of the patients involved in the reports. I expect those health care providers involved in implementing these processes did not conceptualize that they were involved in the involuntary taking of quality from the involved patients…. kind of like eminent domain when they take your house for the new highway (or shopping center). This is actually a medical form of Pareto economics. 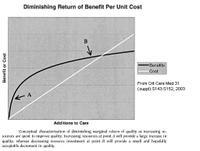 This conservation and reallocation of resources assumes that the Pareto Improvements (4,5,6) in an economic system depicted in the figure are both ethical and legal in health care process innovation notwithstanding the constitutional protections when it comes to eminent domain. Pareto Economics. In an economic system a Pareto improvement occurs if a person made better off can compensate a person potentially worse off such that resources remain after such compensation. This is used to lawfully justify public policy of building roads. If a property must be taken by eminent domain to promote the public good, the American Constitution provides that just compensation must be provided. As everyone knows this taking of property certainly involves awareness of the “takee” with a due process recourse. Too bad the patients suffering involuntary taking of quality are seldom aware and have little recourse for appeal or for compensation. This leads to the notion that not CQI but CQD is the process of our time… a time wherein health care costs are predicted to double. That will never happen. After all as a society, we have to eat, provide for the common defense, and make sure our CEOs are well fed. Recent American case law suggests that the Nuremberg Code of Ethics may now be legally applicable, requiring changes in patient populations disclosure of interventional CQI with accountability to IRBs (7,8,9) or perhaps others sorts of ethical oversight. Given that these patients who suffered involuntary CQD with no prospect of improved outcome and clear risk of injury, one must wonder when this will be used as a legal theory buttressing successful litigation that will change our style of treating patients like widgets. An article about CHIT that everyone should read! Big Brother: Coming Soon to a Hospital Near You! Pain: The Sixth Vital Sign? We’re from the government, and we’re here to help. I Use The BIS Monitor For A Lot More Than Just Preventing Awareness! Should physicians be the leaders of anesthesiology? Donation after Cardiac Death: Is mostly dead slightly alive? "There's a lot of stuff goes on."